I love broccoli. I love it in casseroles, in stir-fries, and as a simple side dish. Broccoli is so healthy for your too, full of vitamins and minerals. I’m also a new fan of cauliflower. We eat it if not every night now, every other night. It is so flexible and can become anything you want it to be. Did you know you can even make a pizza crust from a cauliflower? I know… It is pretty amazing. This is a pretty easy throw together meal too. 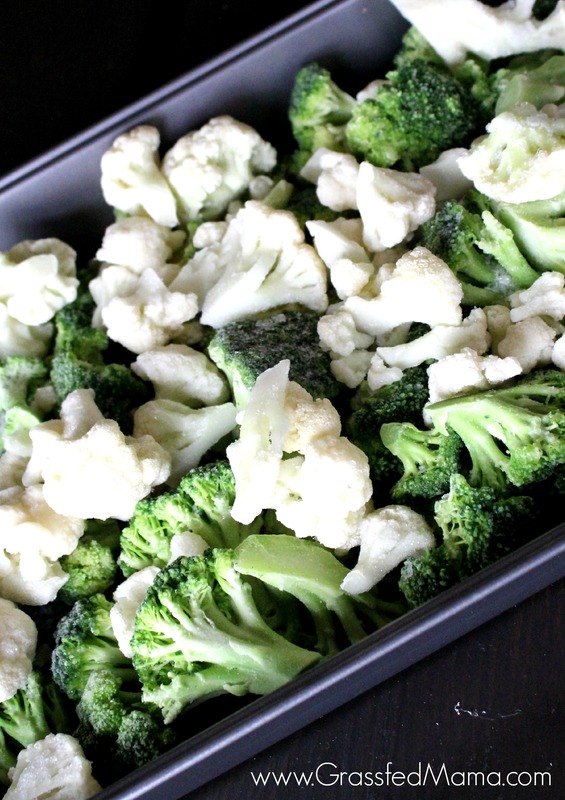 Mix everything in a bowl and just spread it over your broccoli and cauliflower. Top with cheese, because cheese makes everything better. I shred my cheese in my Food Processor. It saves me money and I don’t get the filler ingredients added. Bake it until it is all bubbly and ooey-gooey wonderful! Wait til you dig in to this casserole, I can’t promise you won’t go back for seconds. 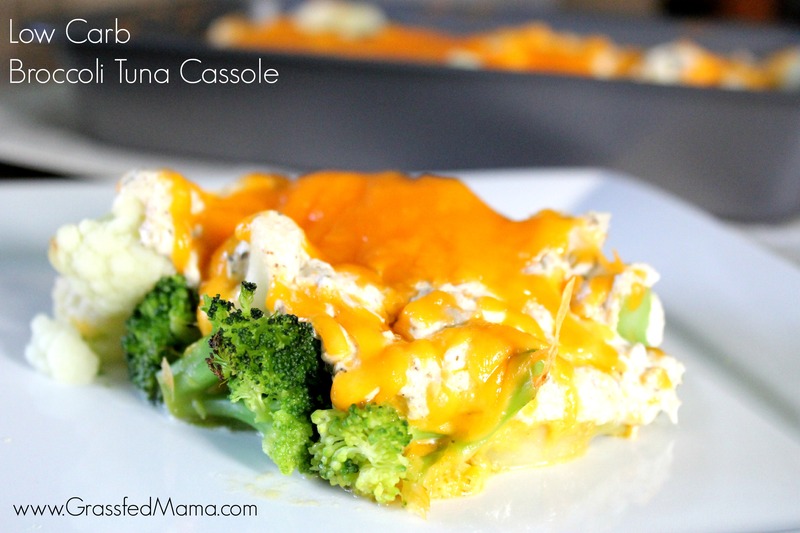 I hope you enjoy this Low Carb Broccoli Tuna Casserole Bake as much as we do! This tuna casserole is low carb and gluten free. It is full of flavor! 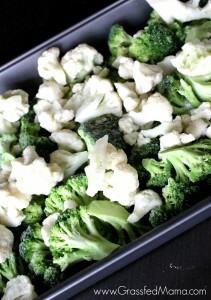 Layer broccoli and cauliflower in 9x13 inch dish. In a separate bowl mix your onion, fish, seasonings, cream cheese and mayo. 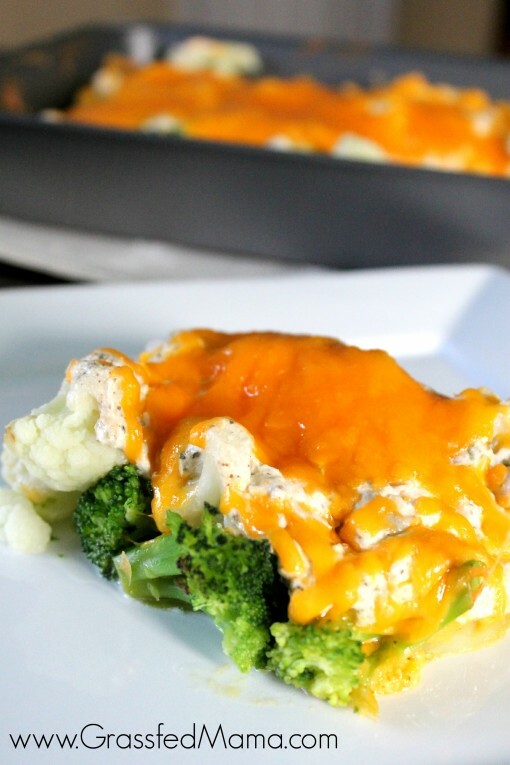 Spread tuna mixture over your broccoli and cauliflower. Bake in oven for 30-45 minutes until everything is bubbly and broccoli is tender. I love casseroles for dinner. What is your favorite casserole? This recipe is very delicious. I just made a slight change and used a garden melody cream cheese instead of plain. Angela, this looks SO good! I am also a recent convert to cauliflower (it was the cauliflower pizza crust that has been making the rounds in blogland that convinced me). So excited to try this recipe because it has broccoli too! Yum! I love cauliflower pizza… so so yummy. My daughter is all about broccoli right now (she’s 3 so anything to get her to eat her vegetables is a double plus). I loved how easy this was to make too. Thanks for leaving me a message! Hi! This looks easy and delicious. Question: Do you thaw or steam the cauli/broccoli prior to baking? Or put it in there frozen? Or use fresh? Thanks! Looks like a easy healthy recipe for a one dish meal. Thanks for sharing on Real Food Friday Blog Hop. Always love your recipe Angela. Have a wonderful healthy day! Thank you! My dad loved anything tuna, so this recipe is perfect for him. I love that this is an easy dinner too. This sounds like a yummy way to have a tuna casserole. We’re big fans of casseroles, too because they’re easy to make and can feed a lot of people. Thanks for linking up at the Pinterest Foodie Party! This looks like a great version. I love your photos as well; makes me want to make some and eat it. This post is also featured at HWF. Congrats. Thank you so so much Jennifer! It looks so yummy and makes me very hungry right now. It is very healthy as well. Thank you for sharing. YUMMY! I’m sending this to Dad. He has diabetes and is always looking for low carb or carb free dishes. Thank you for linking up with the Wake Up Wednesday Linky! Stop back next week to see if you’re featured. My dad loves tuna.. haha. So this was a winner for him : ) I love that eating low carb doesn’t have to be boring grilled chicken salads. Thanks for your comment! I have also made this substituting canned chicken. The flavor is just as tasty. Thank you for this quick weeknight dinner. This was a GINORMOUS hit tonight! All three kids and my husband asked for seconds. I used fresh broccoli and cauliflower and this meal could not have been easier or quicker to put together! Thank you for a delicous, easy, and fantastic recipe!! Heeey 🙂 I love this recipie 🙂 do you think i could replace the cream cheese with sour cream? Do you the nutritional for this dis? Well mainly want to know how menu carbs are in this dish… Looks yummy!! Do you have any ideas on the nutritional values of the ingredients ? what are we talking here on serving size ? It sounds yummy ……. clue me in on what they are ? 4) I love my vegetables, so I usually roughly chop 3-4 different types of vegetables that go well with the other ingredients and throw them into the food processor, pulverizing them with whipping cream before mixing with the tuna/salmon and cream cheese. Tonight I used leftover pieces of eggplant, celery, red onion and green capsicum. Previously I’ve also used mushroom and zucchini, whatever veg I have around usually. I’ve never had a bad result doing this. Though it can be a bit of a balancing act getting all the ingredients not to spill over the top of the casserole dish, I just poke the broccoli and cauliflower until enough of the mixture seeps through to make room for all of it. I tried this tonight and was BLOWN away!!!! I didn’t have quite enough cream cheese, maybe 6 ounces, and I also used mixed broccoli, cauliflower, carrots and zucchini! But, all the rest was exactly as written! I ABSOLUTELY LOVE IT! I wanted to eat the whole thing myself, but had to share with my husband….who also wanted to eat the whole thing! hahahaha Thank you so much! DELISH!!!!! I’m so glad to hear it! I hope it will become a good staple for your family. Thank you Kimberly!! 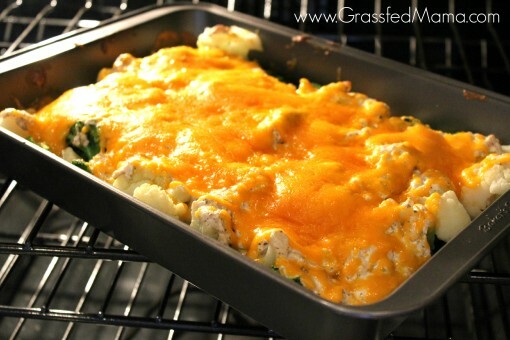 This casserole is so delicious! I make it all the time– it’s great with even chicken or another type of fish. It’s a great way to eat more greens as well. If you’re low carb, do yourself a favour and try this recipe! Thank you so much Tiana!!! My dad would be grinning from ear to ear since this is his favorite! I’d really like to make this and am wondering how leftovers would freeze….? I live solo and while I’m sure I could cut the recipe in half, it’s also great to have things waiting in the freezer for nights I don’t want to cook. I’ve frozen it before I believe and it went fine! Please share with us how it turns out! Would you please email me how many net carbs per serving for this tuna broccoli casserole. It sounds so good. I can’t wait to make it. Thank you. I haven’t done the calculations on this specifically (or I would be happy to send it to you!). If you are able to come up with it when you try I’d love to see what you arrive at! All that cheese—-hard to imagine this is low carb; please add nutritional analysis. Sounds yummy;but I REALLY have to know carb count and serving size. I haven’t done a full analysis of the dish (though if you end up trying it I’d love to see your numbers!). 2 Cups of Shredded Cheddar Cheese is less than 3 Grams so that’s the whole dish. Obviously there is some fat content in the cheese but the carb value is quite low. You could also cut down on the amount of cheese if you wanted to further lower the fat content (it’s just for topping so it’s up to you on how heavy you go). I notice many people asked for the net carbs for this amazing recipe. I make it all the time and did a bit of research, surveying the carb count of different brands of ingredients and calculating the average. Total carbs are 45g, 6 serves at 7.5g each. Thank you Al! I’m so glad you are enjoying the recipe!! This was delicious and so easy to throw together. I only had broccoli so that is what I used. My picky daughter is not a fan of broccoli, but to my surprise, went back for seconds! This recipe is a keeper. I’m so glad! My family has always liked this one and it’s a staple around here! ? I omitted the pepper flakes and used a can of salmon, drained. I don’t remove the bones or skin. I also backed the mayo off to 1/2 cup. Let me first say, the salmon mixture spread is MY NEW FAVORITE SALMON DIP RECIPE! Also, as a constructed casserole, EXCELLENT. I’m anxious to see what the husband thinks. I can’t wait to have my lunch serving tomorrow at work. ? Sounds amazing! I’ll have to try your version soon!